The Ultimate DVD Guide. Composed by Duane Allman, Andy Aledort. Artist/Personality; Guitar DVD; Method/Instruction; Technique Musicianship. Guitar World. Rock. DVD. Alfred Music #56-45279. Published by Alfred Music (AP.56-45279). ISBN 1470633574. English. [Duane Allman] By Andy Aledort. 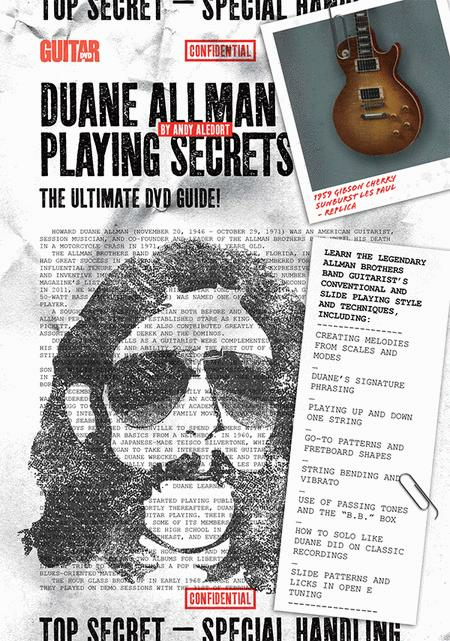 Learn the legendary Allman Brothers Band guitarist's conventional and slide playing styles and techniques. 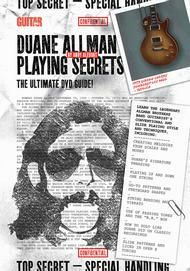 Topics include creating melodies from scales and modes, Duane's signature phrasing, playing up and down one string, go-to patterns and fretboard shapes, string bending and vibrato, use of passing tones and the "B.B." box, how to solo like Duane did on classic recordings, and slide patterns and licks in open E tuning.